The constrictor knot, also known as the Gunner’s knot, is a strong knot used for binding and whipping purposes. The simple knot though thought to be around since long before, gained wide recognition after being published in The Ashley Book of Knots in 1944. It is very difficult to untie and might need the rope to be cut for release. 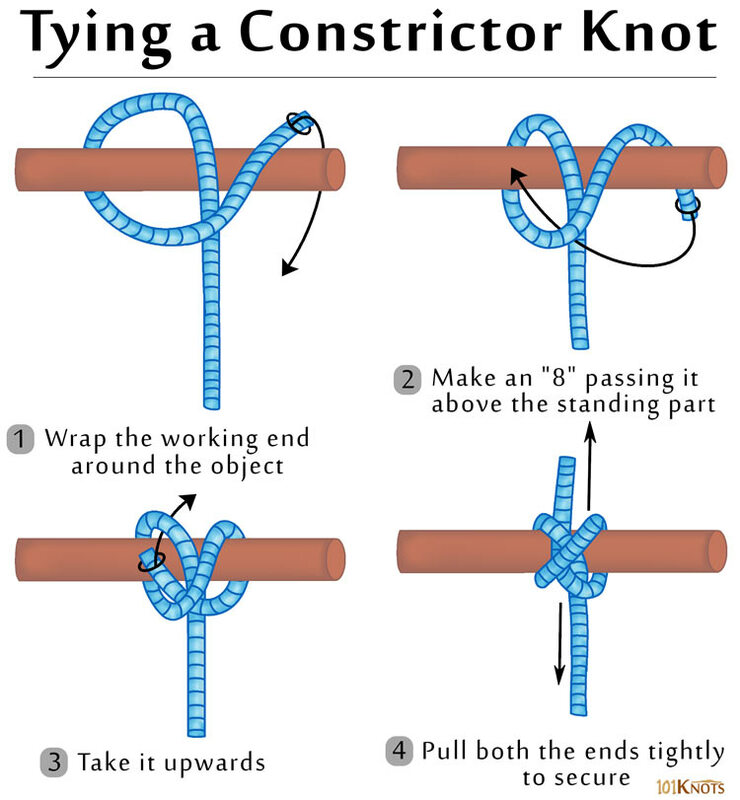 For short lengths, it is better to use the twisting method of tying where the finished knot is dropped over the object. The folding method is beneficial when a long piece of rope is being prepared for binding. Double constrictor knot – A more robust form. Slipped constrictor knot – Gives a quicker release. Can be tied in a bight. Useful when the rope needs to be passed round the object that is to be tied. Cannot be tied to a flat surface. Needs a curved surface for proper function. Offers a quick temporary whipping of the frayed ends of a rope. Binds the ends of a rope together while it is being whipped. To close the openings of sacks or bags tightly. Holds large items together for gluing. Effective as a cable tie or hose clamp. Diagrams 1, 2, and 4 are OK. But diagram 3 was very confusing to me : in fact using diagram 3 I was unable to complete this knot as it appears in diagram 4 and in other descriptions of the tying of this knot.. I have a problem with diagram 3. In fact, in my own mind, the diagram is misleading if not incorrect! When I tried tying the knot using this diagram, I was unsuccessful. I also was unable to follow the caption under diagram 3. 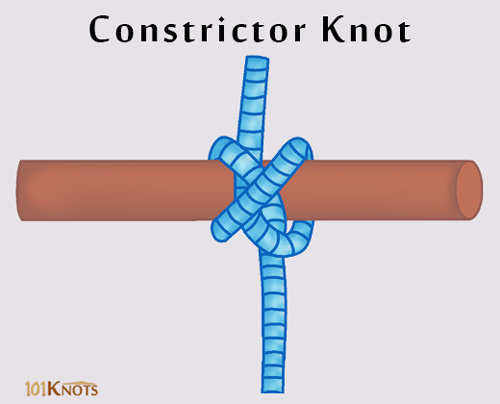 I was finally able to tie the constrictor knot using a utube animation at another website, and the diagrams at the Wikipedia article on the constrictor knot were also very clear and confirmed that the animation was correct. I suspect another knot is being described in error in this article. Hi, we have edited the diagram and the instructions to make them more clear. Thanks for your feedback.